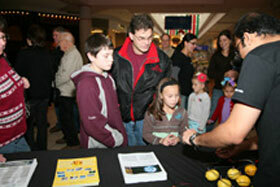 (Nanowerk News) The College of Nanoscale Science and Engineering ("CNSE") presented its first-ever "Nano in the Mall" program on November 14, highlighting the role of nanotechnology in enabling energy efficiency and conservation. Led by Dr. Shadi Shahedipour-Sandvik, CNSE Associate Professor of Nanoengineering, and supported by a grant from the National Science Foundation ("NSF"), the event featuredinteractive demonstrations, displays and detailed information regarding alternative and renewable energy technologies. Designed to engage members of the community on the importance of promoting energy efficiency and developing sustainable energy technologies, including new innovations in areas such as solid state lighting, the program gave visitors the opportunity to participate in hands-on activities involving LED lighting, as well as a up-close look at CNSE's research aimed at promoting clean energy technologies. The event took place during CNSE's month-long community and educational outreach initiative known as NANOvember, part of the CNSE-KeyBank "NEXSTEP" initiative to promote greater understanding of the region's changing economic and business environment driven by nanotechnology, with a special emphasis on children, citizens and community.